It's a bird... it's a plane... no... it's 'Super Pope!' 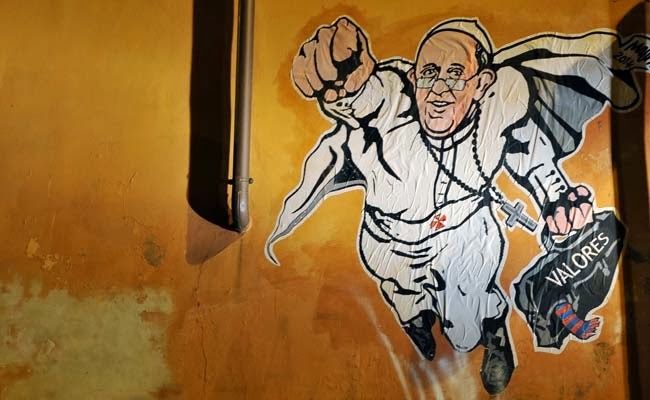 A graffiti image of Pope Francis was found in the streets of the Vatican City in Rome. Pope Francis is featured in a flying pose similar to that of 'Superman.' He has his white papal cassock, his pectoral cross with chain resembling a Rosary, and his black bag with the spanish word "Valores" which means values or morals. The popularity of our Holy Father continues to make news. I hope his teachings are given the same attention.